It's officially December and I will start off this month with a review instead of an outfit post. It's been a while since I did an official review on any sort of product. I have definitely been busy with life, however today on this special month I am back with a review post. On Saturday, I received my Maple VoxBox from Influenster! It was definitely a surprise for myself, I’ve been a member of Influenster for a while, but they only just recently came out with a Canadian VoxBox. That's pretty awesome!! First of all, Influenster is...“Basically, Influenster is a place for culture junkies to come together and share their unique opinions of products and experiences. Active members of Influenster get exclusive access to deals, promotions, and swag from brands that thrive off the input (the good, the bad, and the ugly -- they just want to know what's up).”Taken from Influenster FAQ. 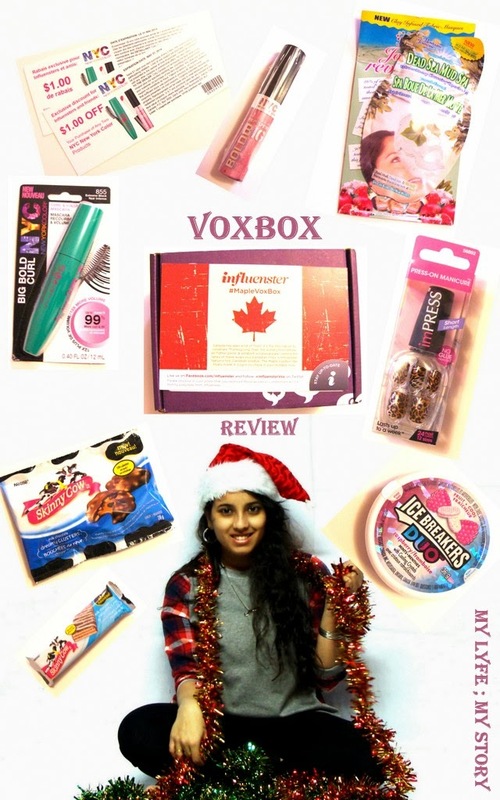 Want to see what I got in my Maple VoxBox? I love big lashes and this definitely works. Plus, it makes them look long!! This lipgloss was my favorite product from the box! It's not super sticky, smells great, and is such a pretty shade. It is slightly "tingly" but I think that's due to the "plumping" effect of the gloss. I will definitely buy this product again! Extremely yummy!! It's definitely taste as well as not much calories!! Give you a fresh breathe and extremely yummy!! Love it!! I think I am getting myself and a few of my friends this one for Christmas, hope they love it as much as I do! Definitely give the face a great moisture and after using it my face looks extremely shiny!! You can sign up to Influenster without any invite/referral, but it’s better to join a network (using someone’s invite). When you join using an invite, you then belong to a “network”. The more influential your network is, the better your score. Each member has a limited amount of invites, so unfortunately I cannot invite you all to be a part of my network. If you’re interested in though, I have 5 invites available. Signing up is free, and the service is free. You do not have to pay for membership or any perks that you may qualify for. If you want to leave me a comment with your email address or send me an email mylyfemystory@gmail.com, I will send you an invite. Once all invites have been sent, I’ll update this post to let you know that they are all gone. The verdict: This was actually a great VoxBox, every single product sample was useful and something I would purchase again. Some things I already knew about, others were a great new discovery. There was also a coupons included!! What do you think of the goodies I received? If you’re not a member, are you going to sign up? Disclosure: I received these products complimentary for testing purposes from Influenster. I am under no obligation to give any sort of review. All opinions stated in this post are my own. Romwe Cyber Monday sale, 2nd December! 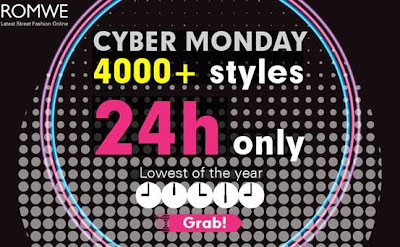 4000+ styles, from $1.99, only 24 hours!